Restaurants, butcher shops, delicatessens and kitchens are work environments that need an efficient space in order to make it safe, clean and dynamic to the frenetic movement of its workers. Italmodular has designed technologically advanced production systems for butchers and kitchens, which allows you to combine practicality and efficiency. For over 50 years, Italmodular contributes with passion, quality and reliability to optimize the organization of work spaces. Our company designs solutions to rationalize and organize storage spaces within every working environment, according to the most diversified customer needs. Meeting the needs of every customer is the mission in every product line, thanks to our experience, the highest quality materials and a focus on innovation. Overhead rails, frameworks and hooked bars for butchery and kitchen departments, are designed by Italmodular to transport, hang up and stow the meat inside any kitchen department. Our company offers you the IM 09 system, a durable product, made with the highest quality materials. Designed to be stable and resistant, it is the ideal solution to complete the furnishing of butchers, delicatessens, kitchens and supermarkets. 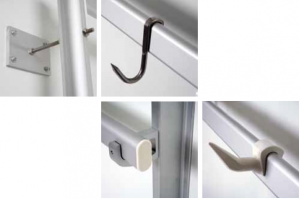 Our product line presents three systems to optimize storage space: overhead rails, frameworks and hooked bars. 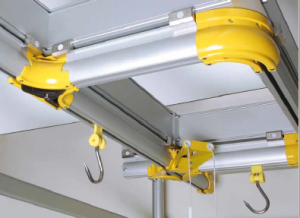 The IM 09 system of overhead rails is a fluid sliding modular system. It is ideal for meat transport, silent, practical and safe. 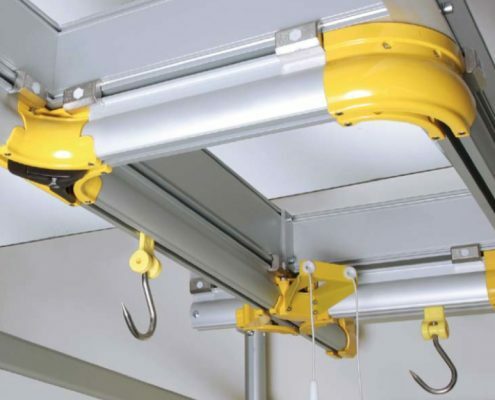 This overhead rail is a system suitable for sliding hooks for food industry, indicated to hang up, transport and stow the meat, inside cold storage and processing rooms. Simple, fast in assembly and customizable with accessories, this system allows a composition that is extremely adaptable to individual application needs. Furthermore, the anodised aluminum alloy and non-toxic plastic materials guarantee hygiene, durability over time, strength and resistance to load and stress. Fluid and silent flowing, the patented three-way exchange from Italmodular is added. A revolutionary system that allows you to move the meat in three directions with extreme simplicity and safety, eliminating the loss of time at each change of direction. Moreover, each rail is customizable with a series of accessories that allow a free composition of the system. The system ensures great adaptability to the most varied needs. It is possible to add fixed or tilting grilled shelves, descents to connect different level rails, pulley stops, anti-condensation devices, joints, electronic scales, stainless steel hooks. The IM 09 framework system by Italmodular is perfect for everyday work activities. 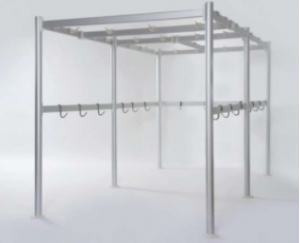 The framework is a modern solution to hang up and stow the meat inside any environment, without drilling panels. Smooth and rounded surfaces, closed profiles, no spaces and cracks where dirt can lodge, guarantee a high standard of hygiene. While, the anodized aluminum material ensures inalterability over time. It is created to resist corrosion by water and moisture. Furthermore, it bears high loads with minimum bending. Simple and quick to assemble, the IM 09 system of hooked bars for butchery and kitchen departments can be customized to any size. Italmodular offers a modular system to create a free composition within any cold room. The system hooked bars are the ideal solution to complete the furnishing of butchers, delicatessens and supermarkets. Our IM 09 system offers adjustable wall or ceiling solutions, either fixed or sliding. The different types of bracket allow the installation of wall or ceiling hooks, fixed or sliding, according to specific needs. Our hooked bars for butchery and kitchen departments are the ideal furniture for your work spaces. They give the possibility to be freely composed in the environments, increasing and optimizing the storage space. The hooks are in aluminum alloy profiles and hooks in stainless steel or non-toxic plastic material. Our materials of the highest quality guarantee inalterability over time against corrosion by water and moisture. Assembly is also quick and easy, thanks to the interlocking systems without the use of special tools. Overhead rails, frameworks and hooked bars are the perfect solution for you and your business. Choose our hooked bars for butchery and kitchen departments, adaptable to both large businesses and small kitchens. Our goal is to create innovative systems to help you organize storage spaces in an effective and intuitive way. In addition to meeting the demands of customers, developing new reliable and cutting-edge solutions. Visit the Italmodular website and discover our products for the optimization of storage space. For more information, please contact us, we will be happy to meet your requests.